In the summer of 2008 the 4-star Anna Grand Hotel **** has opened its gates on the northern shore of Lake Balaton, in the heart of the historical district of Balatonfured, one of the cultural centers of Hungary since the 1800s. The shore of Lake Balaton with the Tagore Promenade is about 100 meters away from the hotel, which is bordered by the Füred Small Forest on the north. In the elegant, more than 200-year old renewed building Anna Grand Hotel - the venue of the famous Anna Balls -, endears its guests with modern comfort and high quality services. The Ipoly Residence wing is located in a120-year-old eclectic art relic building about 100 meters away from the main building, in a spectacular vicinity, about 50 meters from the shore of Lake Balaton. The three-storey, non-smoking Ipoly Residence that is fully accessible for the disabled as well, evokes the milieu of discrete luxury with its spacious, carefully planned, various size bedrooms and apartments partly with terrace perfectly ideal for relaxation. Anna Grand Hotel offers 101 rooms in two different styles. Hotel guests can choose from modern rooms and rooms reconstructed in period style. Every room has air conditioning, LCD TV, telephone, minibar, safe, hair dryer and Internet connection. The elegant, 260-year old restaurant - reconstructed in period style - is the venue of Anna Balls in Balatonfüred all times. The restaurant can be reached from the open Pantheon. We also wish to set up a gourmet restaurant in the other wing of the building in the near future. It is ideal place for those who need chatting in a quiet and elegant place. 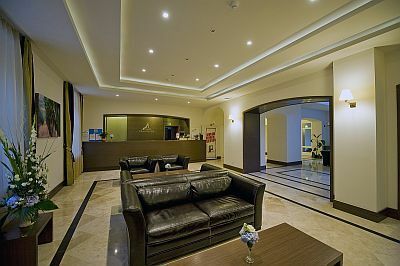 The lobby, facing the reception, has a cafe-corner. Besides the above mentioned the high quality services of the beauty salon and the Biomed health center are also available. Spend a wellness weekend in Anna Grand Hotel in Balatonfured. The aim of our hotel is to be in the forefront not only in wellness. We would like also to make the wine-culture popular. We offer wines to our guests that are produced exclusively from first-class grape. Anna Grand Hotel Balatonfüred is perfectly suitable for big conferences and various events. The facilities of the rooms satisfy the requirements of today's expectation. Our conference rooms are capable of admitting 20-300 participants and our illustrious restaurant is suitable for up to 200 guests for a seated reception. From spring to autumn our banqueting capacity including the arches, terraces and the internal court is suitable for more than 700 guests. The room rates include the following services: buffet breakfast and dinner, bathrobe use, wellness services (swimming pool, fun pool, jacuzzi, Finnish sauna, infrared saunas, steam bath), Internet, VAT. Local tax: 505.- HUF/person/night from the age of 18 years. Extra bed: 25% discount from the double room price per person. In two neighbouring or connecting rooms with 3 guests paying a full price discounts for children are available from the 4th person. Cancellation policy: Cancellation is free of charge 14 days prior to arrival. In case of cancellation within 14 days the penalty is 50% of the price of the ordered services. In case of cancellation within 7 days the penalty is 100% of the price of the ordered services.